In June, Makigami Koichi organizes a Japan tour of Humcrush, the electro unit of improvised music from Norway. He will also participate in performance. The annual festival, which was founded by Makigami last year, will be held in his hometown, Yugawara. This time the unit is to be augmented by guest musicians, and play the pieces of modern composers like John Cage and Robert Ashley. Ticket is now available via e-plus or makigami office (mail at ticketdesk@makigami.com). After a solo set of voice and theremin, upon the band's request, Makigami performed "Marching Watermelon" with them. Makigami Koichi with Danball Bat performed "Marching Watermelon" at UFO Club, Koenji, Tokyo. Did you notice the uniform the band used, white trousers, red jacket and white hat? 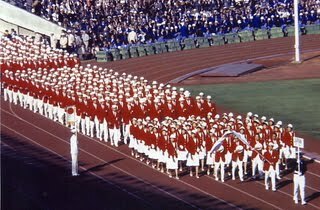 It was a replica of Japan team's uniform in 1964 Summer Olympics Tokyo. The band used it in the period of their debut, late 1979 to early 1980. It was Chikada Haruo's idea. As the producer of the band, he made every effort for getting them exposed in media and the uniform was part of it. Although it was only time they used uniform, it worked well and certainly helped the recognition of the band. 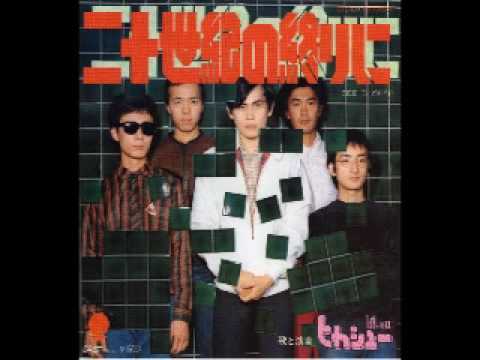 "20 seiki no owari ni" (At the End of the 20th Century) is the first single of Hikashu, released on October 1979. The record company, Toshiba EMI, promoted the single well and the song was frequently played on radio. The band also appeared some TV programs. The publicity boosted the name recognition of the band which they still enjoy. The video quoted below is from TV program broadcasted live on December 1979. The location is La Forêt Harajuku, a department store, which is still in operation. The emcee of the program was Chikada Haruo, who is also the producer of early Hikashu recordings. And he helped a lot for the band getting media attention. The following is a translation of the opening dialog with Chikada and Makigami. Chikada: Next is a band with strange name ... Hikashu. [To Makigami; pretends not to know the band] You are now in recording, right? Makigami: Yes. We are now recording a LP. Chikada: Is there anything you could tell that your music is absolutely different from others? Makigami: Well, probably there are music like ours ... but I could tell you, there is something in music which has been regarded as useless garbage. We took it and reconstructed it in our own way. That's our music, I think. Chikada: So, is there any commercial potential for such kind of thing? Chikada: Okay. You play that song, "At the End of the 20th Century"? If you are to find love at the end of the 20th century, it needs the power of the planets and the magic of death. Try to look through the cutaway of love, then you will find hell or darkness there. What is the thing you are looking for? If you are to lose ideology and try to find love, it needs the light of the moon's surface and the preconceivance of death. Try to look through the atmosphere of love, then you will find ruin or darkness there. Chikada also performed on the same program with his band, Beef. In intro, there is a man talking from audience. He is Kato Kazuhiko, the producer of "Alternative Sun". Besides Fuji Rock, Hikashu will appear 3rd Annual Jazz Art Sengawa this summer. The festival is directed by Makigami Koichi, along with Fujiwara Kiyoto and Sakamoto Hiromichi. It will be held on July 9-11 at Sengawa Theatre and Sengawa Avenue Hall, Tokyo. As always, the program of this year is quite attractive. For instance, Tanikawa Shuntaro is probably the most renowned living poet in post-WWII Japan (he has been a subject of speculations regarding the Nobel Prize in Literature for years), and Tanaka Min is one of the greatest Butoh dancer ever. All these people collected under one roof is simply incredible. Diverse, inter-genre, and prominent in a good way, it is well-representative of creative music scene in Japan. 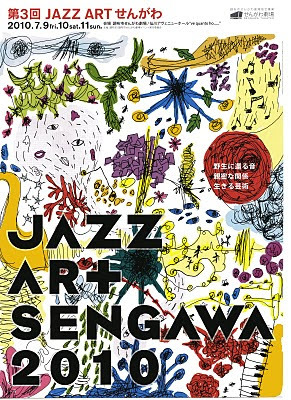 If you are interested in jazz, avant-pop or improvised music of Japan, this is surely not to be missed. Capacity is strictly limited (Sengawa Theatre has only 130 seats and allows no standing) so get in quick. 11:00-11:45 Sunday Matinee Concert: "Violin from Imaginary Country"
All prices listed are for advance. At door, add 500 yen for the prices herein. Tickets are available now at Sengawa Theater office or Ticket Pia.